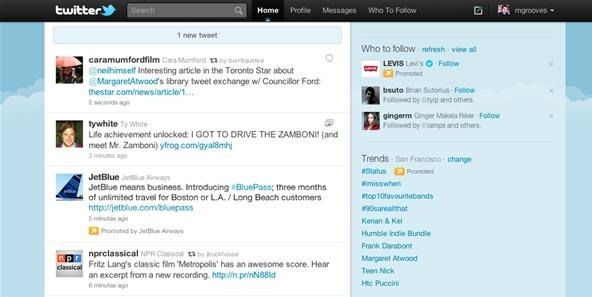 More than a year ago, Twitter rolled out the first phase of its Promoted Tweets ad service, which consisted of selected tweets from advertising partners like Best Buy and Sony Pictures receiving "promoted" exposure in the search results pages on Twitter and in the trends lists. These ads were clearly labeled as such, so it was never any real bother to Twitter users. Twitter has now gone a step further though and moved those Promoted Tweets right into your personal timeline, but you will only see these sponsored tweets if you are already following them. They've been warning us of the day when these "Timely Tweets" would hit our timelines, but now the day is finally here—and some of you might not like it. These "promoted" tweets will only appear in your timeline once, placed at or near the top, and are geared towards helping us stay connected with out favorite brands, businesses and charitable organizations, being the first to get a special announcement, access to exclusive content or some kind of great offer. And as good as that sounds, it makes your timeline less sophisticated and causes an unneeded distraction. "We'll be rolling out and testing this new offering over the next several weeks with a select group of partners, including Best Western, Dell, Gatorade, Groupon, HBO, JetBlue, LivingSocial, Microsoft Xbox, Red Bull, Sephora, Starbucks, Summit Entertainment's "50/50", TNT and Virgin America among others — with more to come soon. During this phase, you may also see Promoted Tweets in your timeline from non-profit organizations you follow, including charity: water, Make-A-Wish Foundation, Room to Read, The American Red Cross and Water.org." So, if you follow any of these companies or charities, your Twitter timeline may become a source of advertising for them. If you're truly dedicated to these brands, then showing your support for them in your timeline is no big deal. And kudos to Twitter for rolling this update out in a fairly unobtrusive way, but some of you are still bound to hate these sponsored tweets—period. Twitter has made it easy to get rid of these Promoted Tweets, which can be accomplished simply by clicking the specific tweet away. If you want to actually opt out of the Promoted Tweets in your timeline, you'll have to un-follow the specific brands and services individually for now. Who knows, maybe Twitter will implement a full opt-out option in the future. Until then... it's one by one. I have to unfollow brands to not get promotional tweets from them? I never follow them in the first place.